This is a new author for me. I am happy to be part of her tour. Although she left her Old Order Amish ways in her youth, Rachel discovered corporate life in the English world to be complicated and unfulfilling. Having returned to Stone Mill, she’s happy to be running her own B&B. But she’s also learning—in more ways than one—that the past is not always so easily left behind. Please check out the rest of the tour too!! I’m a fan of plain speaking and from the sound of it I’d like this series! I have read the first two in this series and have enjoyed them very much. Looking forward to reading the new one. Thanks for the giveaway. 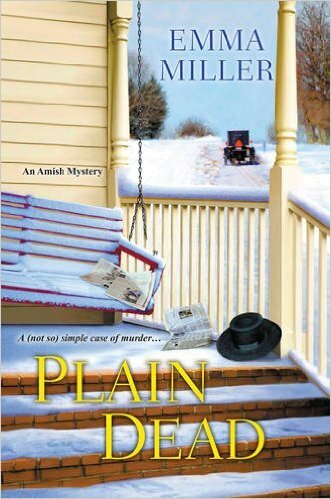 I am intrigued by Plain Dead, and I am looking forward to reading it. Thank you for the giveaway. Sounds like an interesting read. Thanks for the giveaway. I have read a few of the cozy mysteries and reviewed them and this one looks so good! This looks like an exciting mystery – congrats on your newest release! Looking forward to reading it! This looks like a great read. Would really enjoy reading Emma Miller’s book. I like Amish mysteries generally. This one has a different twist so I’ll be adding it to my TBR list. Thank you for the giveaway! This sounds like a great read!